Area: 20,742 sq. km. (8,008 sq. mi. ); about the size of Massachusetts. Cities: Capital: San Salvador (pop. 1.7 million). Other cities — Santa Ana, San Miguel, Soyapango, and Apopa. Terrain: Mountains separate country into three distinct regions — southern coastal belt, central valleys and plateaus, and northern mountains. Climate: Tropical, distinct wet and dry seasons. Nationality: Noun and adjective — Salvadoran(s). Population (2011 est. ): 6.1 million. Annual population growth rate (2011 est. ): 0.32%. Religion (2003 est. ): About 57% Roman Catholic, with significant and growing numbers of Protestant groups. Education: Free through high school. Attendance (grades 1-9) — 92.4%. Literacy — 86.1% nationally; 77.6% in rural areas. Health: Infant mortality rate (2011, CIA World Factbook) — 20/1,000. Life expectancy at birth (2011) — 73.4 years. Work force (about 2.6 million, 2010): By occupation (2011) — agriculture 21%; retail, hotels, and restaurants 29%; industry 15%; construction 5%; other services 29%. Branches: Executive: president and vice president. Legislative — 84-member Legislative Assembly. Judicial — independent (Supreme Court). Political parties (represented in the legislature): Farabundo Marti National Liberation Front (FMLN), Nationalist Republican Alliance (ARENA), National Conciliation Party (PCN), Christian Democratic Party (PDC), Democratic Change (CD), and Great Alliance for National Unity (GANA). GDP (2010, official exchange rate; CIA World Factbook): $21.7 billion. GDP (2010, Central Bank): $21.2 billion. GDP (2010, purchasing power parity; CIA World Factbook): $43.57 billion. GDP annual real growth rate (2010): 1.4%. Per capita income (2010, official exchange rate): $3,431. Per capita income (2010, purchasing power parity; CIA World Factbook): $7,200. Agriculture (12% of GDP, 2010): Products — coffee, sugar, livestock, corn, poultry, and sorghum. Arable, cultivated, or pasture land (2005) — 68%. Industry (19% of GDP, 2010; Central Bank): Types — textiles and apparel, medicines, food and beverage processing, clothing, chemical products, petroleum products, electronics, and call centers. Trade (2010): Exports: $4.5 billion: textiles and apparel, ethyl alcohol, coffee, sugar, medicines, iron and steel products, tuna, light manufacturing, and paper products. Major markets — U.S. 48%, Central American Common Market (CACM) 35.9%. Imports — $8.5 billion: petroleum, iron products, machines and mechanical devices, cars, medicines, consumer goods, foodstuffs, capital goods, and raw industrial materials. Major suppliers — U.S. 36.8%, CACM 19.1%. El Salvador's population numbers about 6.1 million. Almost 90% is of mixed Indian and Spanish extraction. About 1% is indigenous; very few Indians have retained their customs and traditions. The country's people are largely Roman Catholic and Protestant. Spanish is the language spoken by virtually all inhabitants. The capital city of San Salvador has about 1.7 million people; an estimated 37.5% of El Salvador's population lives in rural areas. The first Salvadoran territory visited by Spaniards was Meanguera Island, located in the Gulf of Fonseca, where Spanish Admiral Andres Nino led an expedition to Central America and disembarked on May 31, 1522. In June 1524, the Spanish Captain Pedro de Alvarado started a war to conquer Cuscatlan. His cousin Diego de Alvarado established the village of San Salvador in April 1525. In 1546, Charles I of Spain granted San Salvador the title of city. During the subsequent years, the country evolved under Spanish rule; however, toward the end of 1810 many people began to express discontent. On November 5, 1811, when Priest Jose Matias Delgado rang the bells of La Merced Church in San Salvador calling for insurrection, the people began to band together for freedom. In 1821, El Salvador and the other Central American provinces declared their independence from Spain. When these provinces were joined with Mexico in early 1822, El Salvador resisted, insisting on autonomy for the Central American countries. In 1823, the United Provinces of Central America was formed of the five Central American states under Gen. Manuel Jose Arce. When this federation was dissolved in 1838, El Salvador became an independent republic. El Salvador's early history as an independent state — as with others in Central America — was marked by frequent revolutions; not until the period 1900-30 was relative stability achieved. Following a deterioration in the country's democratic institutions in the 1970s a period of civil war followed from 1980-1992. More than 75,000 people are estimated to have died in the conflict. In January 1992, after prolonged negotiations, the opposing sides signed peace accords which ended the war, brought the military under civilian control, and allowed the former guerillas to form a legitimate political party and participate in elections. El Salvador is a democratic republic governed by a president and an 84-member unicameral Legislative Assembly. The president is elected by universal suffrage by absolute majority vote and serves for a 5-year term. A second round runoff is required in the event that no candidate receives more than 50% of the first round vote. Members of the assembly are elected based on the number of votes that their parties obtain in each department (circumscriptive suffrage) and serve for 3-year terms. The country has an independent judiciary and Supreme Court. Legislative and municipal elections were held in January 2009, and presidential elections were held in March 2009. Hard-line conservatives, including some members of the military, created the Nationalist Republican Alliance party (ARENA) in 1981. ARENA almost won the election in 1984 with solid private sector and rural farmer support. By 1989, ARENA had attracted the support of business groups. Multiple factors contributed to ARENA victories in the 1988 legislative and 1989 presidential elections, including allegations of corruption in the ruling Christian Democratic party which had poor relations with the private sector, and historically low prices for the nation's main agricultural exports. The successes of Alfredo Cristiani's 1989-94 administration in achieving a peace agreement to end the civil war and in improving the nation's economy helped ARENA — led by former San Salvador mayor Armando Calderon Sol — keep both the presidency and a working majority in the Legislative Assembly in the 1994 elections. ARENA's legislative position was weakened in the 1997 elections, but it recovered its strength, helped by divisions in the opposition, in time for another victory in the 1999 presidential race, bringing President Francisco Guillermo Flores Perez to office. Flores concentrated on modernizing the economy and strengthening bilateral relations with the United States. Under his presidency El Salvador committed itself to combating international terrorism, including sending troops to aid in the reconstruction of Iraq. El Salvador also played a key role in negotiations for the Central American Free Trade Agreement (CAFTA-DR). Taking advantage of both public apprehension of Flores' policies and ARENA infighting, the chief opposition party, the Farabundo Marti National Liberation Front (FMLN), was able to score a significant victory against ARENA in the March 2003 legislative and municipal elections. ARENA, left with only 29 seats in the 84-seat Legislative Assembly, was forced to court the right-wing National Conciliation Party (PCN) in order to form a majority voting bloc. However, in 2003 the PCN entered into a loose partnership with the FMLN, further limiting ARENA's ability to maneuver in the legislature. Despite these constraints, ARENA made a strong showing in the March 2004 presidential election, which was marked by an unprecedented 67% voter turnout. ARENA candidate Elias Antonio "Tony" Saca handily defeated the FMLN candidate and party head Shafick Handal, garnering 57.7% of the votes cast. The defeat of the FMLN's presidential candidate rekindled an internal FMLN struggle between hardliners and more moderate members who saw the party's 2004 defeat as a call for reform. In January 2009 legislative and municipal elections, the incumbent ARENA party garnered 32 assembly deputies and 122 mayoralties, while the opposition FMLN won 35 legislative seats and 75 city halls (plus 21 additional mayoralties in which they participated as part of a coalition). The PCN, PDC, and CD carried 11, 5, and 1 assembly seats, respectively. The new assembly took office in May 2009. In October 2009, 12 ARENA deputies left the party to form a new movement, the Great Alliance for National Unity (GANA), and two other deputies (one each from ARENA and the PCN) left their parties to become independents. As of January 2010, the assembly was composed as follows: FMLN - 35 seats, ARENA - 19 seats, GANA - 12 seats, PCN - 10 seats, PDC - 5 seats, CD - 1 seat, independent deputies - 2 seats. In December 2009, former President Antonio Saca was expelled from ARENA for his suspected involvement in the defection of the GANA deputies. On March 15, 2009, FMLN candidate Mauricio Funes won El Salvador's presidential elections, defeating ARENA candidate Rodrigo Avila. Final vote totals were 51.3% for the FMLN and 48.7% for ARENA. The elections marked the first time since the 1992 peace agreement that ended the civil war that an FMLN candidate was elected president and the first left-of-center government in El Salvador's history. President Funes was inaugurated on June 1, 2009. During the 12-year civil war, human rights violations by both the government security forces and left-wing guerillas were rampant. The accords established a Truth Commission under UN auspices to investigate the most serious cases. The commission recommended that those identified as human rights violators be removed from all government and military posts. Thereafter, the Legislative Assembly granted amnesty for political crimes committed during the war. Among those freed as a result were the Salvadoran Armed Forces (ESAF) officers convicted in the November 1989 Jesuit murders and the FMLN ex-combatants held for the 1991 murders of two U.S. servicemen. The peace accords also established the Ad Hoc Commission to evaluate the human rights record of the ESAF officer corps. In accordance with the peace agreements, the constitution was amended to prohibit the military from playing an internal security role except under extraordinary circumstances. Demobilization of Salvadoran military forces generally proceeded on schedule throughout the process. The Treasury Police, National Guard, and National Police were abolished, and military intelligence functions were transferred to civilian control. By 1993 — 9 months ahead of schedule — the military had cut personnel from a war-time high of 63,000 to the level of 32,000 required by the peace accords. By 1999, ESAF strength stood at less than 15,000, including uniformed and non-uniformed personnel, consisting of personnel in the army, navy, and air force. A purge of military officers accused of human rights abuses and corruption was completed in 1993 in compliance with the Ad Hoc Commission's recommendations. The military's new doctrine, professionalism, and complete withdrawal from political and economic affairs have made it one of the most respected institutions in El Salvador. More than 35,000 eligible beneficiaries from among the former guerrillas and soldiers who fought in the war received land under the peace accord-mandated land transfer program, which ended in January 1997. The majority of them also received agricultural credits. The National Civilian Police (PNC), created to replace the discredited public security forces, deployed its first officers in March 1993 and was present throughout the country by the end of 1994. The PNC has 21,332 officers. The United States, originally through the International Criminal Investigative Training Assistance Program (ICITAP) and subsequently through the Department of State's Bureau for International Narcotics and Law Enforcement Affairs, led international support for the PNC and the National Public Security Academy (ANSP), providing about $32 million in non-lethal equipment and training since 1992. Following the peace accords, both the Truth Commission and the Joint Group identified weaknesses in the judiciary and recommended solutions, including the replacement of all the magistrates on the Supreme Court. This recommendation was fulfilled in 1994 when an entirely new court was elected, but weaknesses remain. The process of replacing judges in the lower courts, and of strengthening the attorney generals' and public defender's offices, has moved slowly. The government continues to work in all of these areas with the help of international donors, including the United States. Amendments to the Criminal Procedure Code were passed in 2011 and will go into force in May 2012. El Salvador maintains an Embassy in the United States at 1400 16th Street NW, Washington, DC, 20036 (telephone: 202-595-7500). There are consulates in Brentwood, NY; Boston, MA; Chicago, IL; Coral Gables, FL; Dallas, TX; Duluth, GA; Elizabeth, NJ; Houston, TX; Las Vegas, NV; Los Angeles, CA; New York, NY; Nogales, AZ; Santa Ana, CA; San Francisco, CA; and Woodbridge, VA. 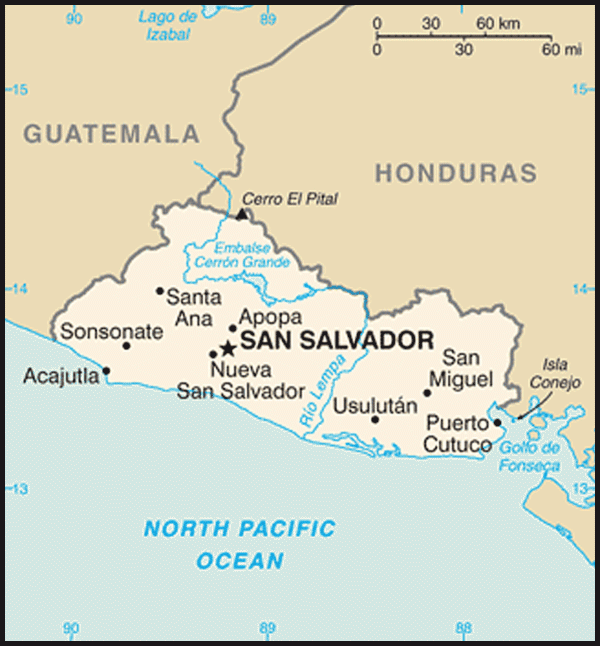 The smallest country in Central America geographically, El Salvador has the third-largest economy in the region. In the last two decades, El Salvador has made considerable progress in social and economic transformation, undertaking significant social sector reforms that led to improvements in social indicators. These reforms contributed to an increase in the country's Human Development Index — which aggregates measures of life expectancy, adult literacy and school enrollment, and income per capita — from 0.524 in 1990 to 0.674 in 2010, and a decrease in the share of households living in poverty by 23.2 percentage points, from 59.7% in 1990 and 36.5% in 2010. El Salvador ranks 105th in the Human Development Index worldwide. Much of the improvement in El Salvador's economy is a result of the privatization of the banking system, telecommunications, public pensions, electrical distribution and some electrical generation; reduction of import duties; elimination of price controls; and improved enforcement of intellectual property rights. Capping those reforms, on January 1, 2001, the U.S. dollar became legal tender and the economy is now fully dollarized. However, El Salvador's economy remains strongly linked to world and U.S. economic cycles. From 2000 to 2010, the Salvadoran economy averaged 2% annual economic growth, with GDP receding by 3.1% in 2009 due to the financial crisis and recovering only to 1.4% growth in 2010. El Salvador was expecting 1.4% economic growth in 2011, lower than previously anticipated. These rates of growth are decidedly below the Latin American average, and the Government of El Salvador is determined to reverse these trends by laying the groundwork for a development model built on a new cycle of investment and economic growth through the Partnership for Growth (PFG) initiative. The Salvadoran Government has maintained fiscal discipline during post-war reconstruction and reconstruction following earthquakes in 2001 and hurricanes in 1998 and 2005. Taxes levied by the government include a value added tax (VAT) of 13%, income tax of 30%, excise taxes on alcohol and cigarettes, and import duties. The VAT accounted for about 51.7% of total tax revenues in 2011. El Salvador's public external debt in December 2011 was about $11.9 billion, 53.2% of GDP. Performance under a 3-year Stand-By Arrangement with the International Monetary Fund remains on track. Years of civil war, fought largely in the rural areas, had a devastating impact on agricultural production in El Salvador. The agricultural sector experienced significant recovery, buoyed in part by higher world prices for coffee and sugarcane and increased diversification into horticultural crops. Seeking to develop new growth sectors and employment opportunities, El Salvador created new export industries through fiscal incentives for free trade zones. The largest beneficiary has been the textile and apparel (maquila) sector, which directly provides approximately 80,000 jobs. Services, including retail and financial, have also shown strong employment growth, with about 63% of the total labor force now employed in the sector. Remittances from Salvadorans working in the United States are an important source of income for many families in El Salvador. In 2011, the Central Bank estimated that remittances totaled $3.6 billion. UN Development Program (UNDP) surveys show that an estimated 21.3% of families receive remittances. Under its export-led growth strategy, El Salvador has pursued economic integration with its Central American neighbors and negotiated trade agreements with the Dominican Republic, Chile, Mexico, Panama, Taiwan, Colombia, and the United States. 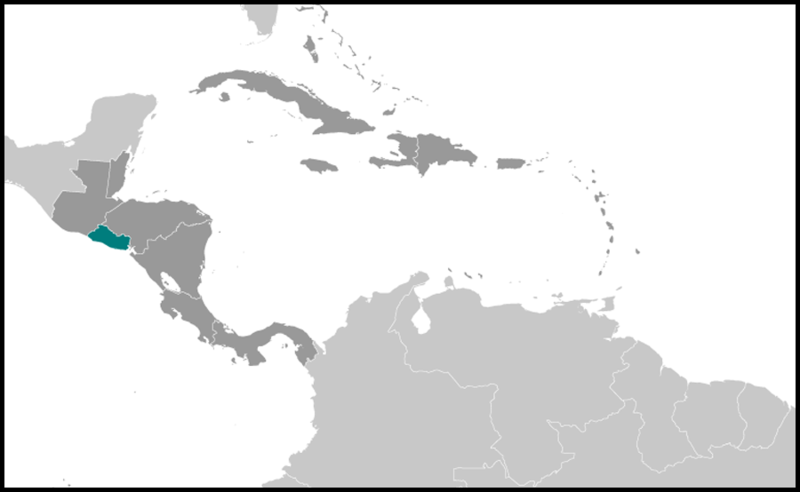 In 2010, Central America signed an Association Agreement with the European Union that includes the establishment of a free trade area, which is expected to enter into force in 2012. In 2011, El Salvador signed a Partial Scope Agreement (PSA) with Cuba. The Central American countries are negotiating a free trade agreement with Canada and Peru. Exports grew by 18.4% in 2011 and imports by 19.1%. As in previous years, the large trade deficit was offset by family remittances. In 2006, El Salvador was the first country to ratify the U.S.-Central America-Dominican Republic Free Trade Agreement (CAFTA-DR), which has bolstered the export of processed foods, sugar, and ethanol, and supported investment in the apparel sector amid increased Asian competition and the expiration of the Multi-Fiber Arrangement in 2005. From 2005 to 2011, Salvadoran exports to the U.S. increased by 27%, while imports from the U.S. increased 84%. In addition to trade benefits, CAFTA-DR provides trade capacity building, particularly in the environment and labor areas, and a framework for additional reforms on issues such as intellectual property rights, dispute resolution, and customs to improve El Salvador's investment climate. As it has promoted an open trade and investment environment, El Salvador also has embarked on a wave of privatizations extending to telecommunications, electricity distribution, banking, and pension funds. U.S. support for privatization of the electrical and telecommunications markets markedly expanded opportunities for U.S. investment in the country. More than 300 U.S. companies have established either a permanent commercial presence in El Salvador or work through representative offices in the country. The U.S. Department of Commerce maintains a Country Commercial Guide for U.S. businesses seeking detailed information on business opportunities in El Salvador. On November 29, 2006, the Government of El Salvador and the Millennium Challenge Corporation (MCC) signed a 5-year, $461 million anti-poverty Compact to stimulate economic growth and reduce poverty in the country's northern region. The grant seeks to improve the lives of approximately 850,000 Salvadorans through investments in education, public services, enterprise development, and transportation infrastructure. The Compact entered into force in September 2007 and will conclude in September 2012. In December 2011, the MCC Board of Directors approved El Salvador's eligibility to develop a proposal for a second Compact for consideration. El Salvador is one of four countries that will participate in the Partnership for Growth, which will put into practice the principles of President Barack Obama's Policy Directive on Global Development. The Partnership for Growth represents a new way of doing business focused on using the full range of available development resources — trade, private investment, traditional financial assistance, technical assistance, private sector activity, and more — to spur higher, sustained, and more inclusive economic growth in El Salvador. To make this possible, a joint United States and El Salvador team conducted an in-depth analysis and identified the two primary constraints to economic growth in El Salvador — crime and insecurity and low productivity in trade-related activities. Having worked together to identify the key constraints, these two teams then worked together to craft joint solutions, which form the heart of the Joint Country Action Plan (JCAP). The JCAP lays out how the two countries will work together to unlock these constraints to growth by promoting a business-friendly environment, investing in people through education, and strengthening anti-crime and violence prevention efforts. The Action Plan also provides a framework for other partners — donor governments and institutions — to work with El Salvador in a similarly focused manner. Located on the Pacific's earthquake-prone Ring of Fire and at latitudes affected by hurricanes, El Salvador's history has included a number of catastrophes, including the Great Hurricane of 1780 that killed 22,000 in Central America and earthquakes in 1854 and 1917 that devastated El Salvador and destroyed most of the capital city. In October 1986, an earthquake killed 1,400 and seriously damaged the nation's infrastructure. In 1998, Hurricane Mitch killed 10,000 in the region, although El Salvador — lacking a Caribbean coast — suffered less than Honduras and Nicaragua. Major earthquakes in January and February of 2001 took another 1,000 lives and left thousands more homeless and jobless. El Salvador's largest volcano, Santa Ana (also known by its indigenous name Ilamatepec), erupted in October 2005, spewing sulfuric gas, ash, and rock on surrounding communities and coffee plantations, killing two people and permanently displacing 5,000. Also in October 2005, Hurricane Stan unleashed heavy rains that caused flooding throughout El Salvador. In all, the flooding caused 67 deaths and more than 50,000 people were evacuated at some point during the crisis. Damages from the storm were estimated at $355.6 million. In November 2008, rains from Tropical Storm Ida caused flooding and mudslides that killed at least 199 and left extensive property damage in the departments of Cuscatlan, La Paz, San Vicente, and San Salvador. In 2010 property evacuation operations by the authorities prevented a higher number of deaths. In June 2010, Tropical Storm Alex killed 5 people and damaged 349 homes, and in September 2010, Tropical Storm Matthew killed 3 people and damaged 141 homes. In October 2011, Tropical Depression Twelve-E and other weather systems hit El Salvador, killing 34 people and damaging 4,516 homes. The storm systems caused severe flooding, landslides, and damaged infrastructure, including 36 bridges. El Salvador is a member of the United Nations and several of its specialized agencies, the Organization of American States (OAS), the Central American Common Market (CACM), the Central American Parliament, and the Central American Integration System (SICA). It actively participates in the Central American Security Commission (CASC), which seeks to promote regional arms control. From 2002-2003, El Salvador was chair of the OAS anti-terrorism coordinating body, CICTE. El Salvador also is a member of the World Trade Organization and is pursuing regional free trade agreements. An active participant in the Summit of the Americas process, El Salvador has chaired a working group on market access under the Free Trade Area of the Americas initiative. El Salvador has joined its six Central American neighbors in signing the Alliance for Sustainable Development, known as the Conjunta Centroamerica-USA or CONCAUSA to promote sustainable economic development in the region. U.S.-Salvadoran relations remain close and strong. U.S. policy toward El Salvador promotes the strengthening of El Salvador's democratic institutions, rule of law, judicial reform, national reconciliation and reconstruction, and economic opportunity and growth. El Salvador was a committed member of the coalition of nations fighting against terrorism and sent 11 rotations of troops to Iraq to support Operation Iraqi Freedom from 2003 through 2008. The U.S. and Salvadoran Governments cooperate closely to combat narcotics trafficking and organized crime. El Salvador hosts the International Law Enforcement Academy, which provides training to police, prosecutors, and other officials from across the Latin American region. El Salvador's Air Force installation near Comalapa Airport houses a monitoring facility that surveils narco-trafficking routes in the Eastern Pacific. The Federal Bureau of Investigation (FBI) and El Salvador's National Civilian Police jointly operate the Transnational Anti-Gang unit, which addresses the growing problem of street gangs in both countries. In January 2009, the U.S. and El Salvador signed letters of agreement committing both countries to work jointly under the Merida Initiative to fight crime and drug trafficking. In March 2011, President Obama visited San Salvador, affirming the United States' continued commitment to fight narco-trafficking and related violence in El Salvador and the Central American region. El Salvador will continue to receive funds through the Central America Regional Security Initiative (CARSI) — implemented in 2008 — to increase public security and law enforcement as well as support economic and social development. U.S. ties to El Salvador are dynamic and growing. More than 19,000 American citizens live and work full-time in El Salvador. Most are private business people and their families, but a small number of American citizen retirees have been drawn to El Salvador by favorable tax conditions. The Embassy's consular section provides a full range of citizenship services to this community. The American Chamber of Commerce in El Salvador is located at World Trade Center, Torre 2, local No. 308, 89 Av. Nte. Col. Escalon, phone: 2263-9494.